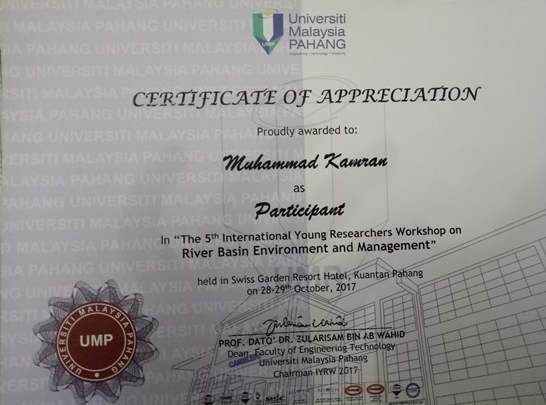 Mr. Muhammad Kamran (Alumni from Pakistan, 3rd Intake) presented his research findings at the 5th International Young Researchers Workshop (IYRW) on River Basin Environment and Management held on 28th ~ 29th October 2017 in Kuantan, Malaysia. Only 35 papers including this paper had been selected among all researchers. 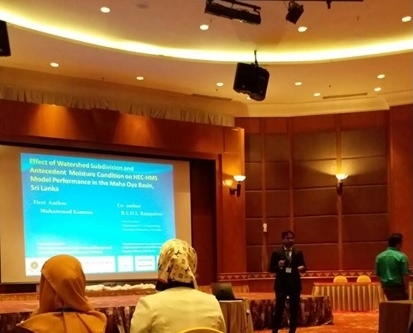 Basically, the international conference focused on (1) knowledge and information sharing on recent advances in the general researches and management of river basin systems, (2) technical exchanges and capacity building for young researchers and professionals, (3) networking for future collaborations for researches and event organizing. The workshop was organized by Science Union for River Basin Researches and Friends (SURF), Universiti Malaysia Pahang (Malaysia), University of Yamanashi (Japan), University of Newcastle (Australia), Asian Institute of Technology (Thailand), Naresuan University (Thailand), Hanoi University of Science – VNU (Vietnam), University of Science - VNUHCM (Vietnam), University of Brawijaya (Indonesia), and Center of Research for Environment, Energy and Water (CREEW, Nepal). The extended abstract submitted was published in the conference proceedings while the selected full paper was published in The International Journal on Engineering Technology and Sciences (IJETS; Impact Factor 0.887). Mr. Kamran is presently employed by the Irrigation Department - Government of Punjab, Lahore, Pakistan as an Assistant Director (WRM). 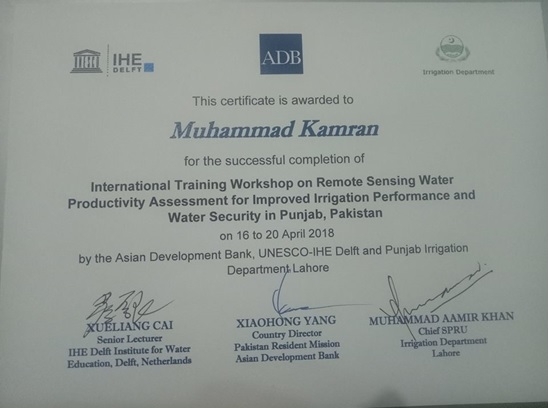 He attended the International Training Workshop on Remote Sensing Water Productivity Assessment for Improved Irrigation Performance and Water Security in Punjab from 16~20 April 2018 hosted by the Asian Development Bank (ADB), UNESCO-IHE Delft and Punjab Irrigation Department, Lahore.